Get great performance for your personal computing and the quality and reliability you expect from the Intel Inside brand with Intel Celeron processors for desktop PCs. Discover how Intel Celeron processors for desktop computing give you the performance to run the most common home applications - from finance management to the Internet and interactive games - at a terrific value. 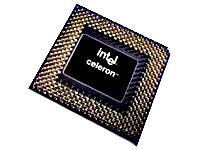 Intel Celeron processors also give you quick, responsive performance for today's business applications and provide cost-effective, managed client solutions that help IT cut capital costs while deploying reliable, manageable platforms. Whether you use today's applications at home, the office or on the road, there's an Intel Celeron processor that fits both your performance needs and your budget.